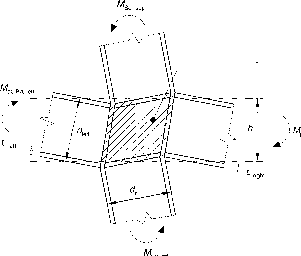 The ductility condition for steel beams with a slab subjected to sagging moments complies with the general objective of achieving ductile dissipative zones with a reliable resistance: the integrity of concrete is maintained during the design seismic event and yielding takes place in the steel section and/or in the rebars. The problem of ductility appears only if the concrete might reach its crushing strain in compression in a brittle way due to the application of positive (sagging) bending moments. Under negative (hogging) moments, there is no such problem, because the tensile strength of concrete is neglected and the composite section thus behaves like a section without concrete. Considering the distribution of strains under a positive bending moment in a composite section consisting of a steel beam with slab, the ductility objective can be reached if, at the ULS, the concrete strain at the top fibre is below the concrete crushing strain, ecu2, while significant total strain ea develops at the bottom fibres (steel). Geometrical considerations in Fig. 7.1 define the corresponding limit position x/d of the neutral axis (equation (7.4) in EN 1998-1). All x/d values below that limit achieve the ductility condition e < ecu, specified in clauses 7.6.2(7) and 7.6.2(8). The values in Table 7.4 have been calibrated through cyclic tests on beam-column subassemblages and in three-dimensional tests. When a profiled steel sheeting with ribs transverse to the supporting beams is used, the reduction factor kt of the design shear resistance of connectors given in Eurocode 482 should be reduced further by the rib shape efficiency factor kt mentioned in clause 7.6.2(6). This reduction takes into account the uplift forces induced at the ULS in the slab by a steel deck with trapezoidal shape and a positive slope a. These uplift forces may cause concrete failure over a cone around the connector, at an applied shear less than the design shear resistance. Section 7.8. The limit value of the c/t ratio of a web subjected to bending and compression depends on the slenderness of the part in compression, which depends in turn on the position of the plastic neutral axis in the section. web in compression and consequently its class. The position of the neutral axis is directly linked to the cross-sectional area of the reinforcement within the effective width of the slab. With an increase of the amount of reinforcement in the effective width, the neutral axis rises within the section, and the limit slenderness of the web in compression increases. The ductility requirement for the steel web thus leads implicitly to a condition on the cross-sectional area of rebars: As <Aiimit class, within the effective width beS. The higher the desired class of the section, the lower is the value of^4limit which enables a section to belong to a given class. Table 7.3 of EN 1998-1 does not provide directly applicable guidance on this design problem. The more complete Table 7.1 in Section 7.8 gives the worst-case limits for the slenderness c/t of webs of H or I sections, which correspond to a web being fully in compression when the section is subjected to a hogging plastic moment.